Why does psychotherapy matter in the modern world? On the face of it, a process that is long-term, happens at the same time, on the same day, each week, would seem to be in stark contrast to modern life. We are promised, and expected to subscribe to, a world where our wants and needs can be met almost instantaneously, where we can have things exactly as we want them and everything – society, identity, gender and sexuality – is up to debate and can be changed. And changed and changed again. Social media floods our senses with messages about how to be happy, grateful and fulfilled whilst espousing ‘hacks’ and quick fixes for depression, anxiety and every human condition in between. The shelves in book shops buckle under the weight of the latest ‘self-help’ guru or fad and life coaching promises tangible change in a few sessions. And if it does not work for us? Well, then we are simply not trying hard enough. Psychotherapy subscribes to, and offers, none of the above. It is not quick, it is not an experience where you can get immediate gratification or a relationship that will affirm you as always being right. It is something very different. In many ways, psychotherapy is an antidote to all of the above. It is about learning through relationship to be in relationship with ourselves. Through relationships we begin to see ourselves through the separate eyes of another who is compassionate, boundaried and can withstand us; nobody should become a psychotherapist if they want to be loved. Psychotherapy is the opposite of Instagram and Facebook – it is about deeply knowing and accepting who we are and learning to live a meaningful live of substance and depth: it is about learning to be ordinary. And it is about accepting the realities of life: that life is unfair, often hard and that the only substance is to be found in relationship. Car crashes have a nasty habit of drawing our attention. And then, of course, the likely outcome is another crash. When we see a car crash it takes a mature mind and person to not join it; to keep their eyes on the road and focus on their own experience. The modern world is comprised of ever more car crashes – not necessarily in the literal sense, but in the many dramas (real and streamed to us) that draw our attention away from the road. Psychotherapy is an antidote to this – helping people steer a steady course through the chaos and drama and remaining in relationship to themselves. In this sense, psychotherapy matters very much in the modern world. 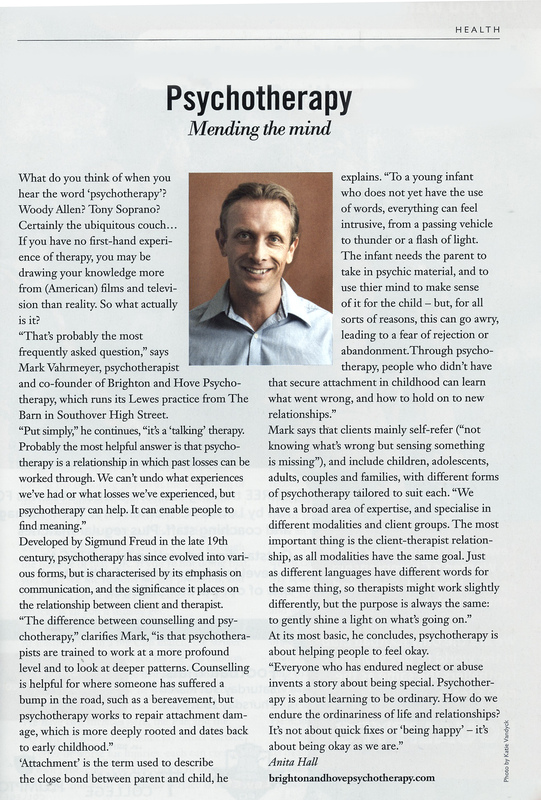 Mark Vahrmeyer is UKCP Registered and is one of the Brighton & Hove Psychotherapy Co-founders. He is an Integrative Psychotherapist with a wide range of clinical experience from both the public and private sectors. He currently sees both individuals and couples, primarily for ongoing psychotherapy. Mark is available at our Lewes and Brighton & Hove Practices. I’m in agreement with Brett Kharr who argues that unfortunately we have a strange situation in therapy where there are an almost innumerable different types of therapies to choose from. I think this reflects the consumerist, swipe right, swipe left age we live in and actually makes starting therapy more confusing for clients. If, as a client, you are serious about wanting to change things and about wanting to engage in therapy then it does pay to think a bit about which therapist and therapy may be a good match for you. Sometimes you may feel comfortable with the first therapist you meet after perhaps doing some online research or obtaining a personal recommendation. Sometimes you may want to have a few initial consultations with different therapists. As a therapist I would always be more than happy for you to do this. As a client I would advise on being as honest as possible with the therapists you meet about this, as it’s a good chance to gage their reaction. A therapist where you feel you might have to worry about hurting their feelings, may not be the best choice. “Make sure to give your therapist hell”. I have often thought about that statement and have come to appreciate, that I think at essence, its saying how important it is to be as honest as possible in therapy, especially about the things you don’t want to say and especially about the things you don’t want to say to your therapist. This may feel strange. You may feel your therapist is annoying, a disappointment, etc. What’s useful about this and I believe unique to therapy is that the therapist who has had a thorough therapy themselves won’t take it personally, they will be able to reflect on the bits that may be true, but also may be able to help you think about the bits you may be bringing that you may also bring to other areas of your life. Is the experience of finding your therapist annoying/boring/uncaring or whatever, something you experience in other areas of your life in relation to other people? If so the special circumstances of the therapeutic relationship can be a unique chance gain insight into these recurring patterns as they are happening, not just in an intellectual way but also at a deeper more affective level. It is at that level that I believe change can really occur. Paul Salvage is a Psychodynamic Psychotherapist trained to work with adolescents from 16-25 and adults across a wide range of specialisms including depression, anxiety, family issues, self awareness and relationship difficulties. He currently works with individuals in our private practice in Hove. Mark is an integrative psychotherapist with a wide range of clinical experience from both the public and private sectors. He currently sees both individuals and couples, primarily for ongoing psychotherapy.